It is likely that we won’t make you ride the public transport by yourself for your first time, but it is good to get a lesson on how it works. Once you know how to buy a ticket and how to go the right direction, it is easy! The first thing to know is that you must have a ticket. If you are caught without it, it is something like 100 CHF payable on the spot. If you don’t have 100 CHF, they will walk with you to an ATM. The second thing is that you do not actually have to show that ticket to anyone unless you are “checked” by a TPG officer (rarely happens). But tuck it in a safe place in case that happens on your journey. The third thing to know is that you must have change handy to buy a ticket. In Switzerland, everything under a 10 CHF note is in change (see A’s post for the breakdown). If it is not exact change, it gives you a receipt that you can cash in for your change. There are only two offices and the lines are long, so I recommend putting in exact change. Or, you can always give your credit receipts to me as a present. 1. Decide how many separate times you’ll take public transport in the day. 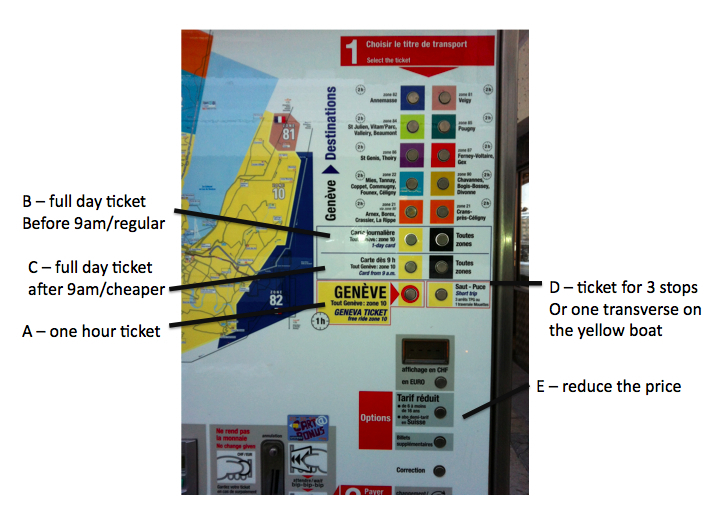 If just once or twice, you should just get a ordinary one-hour ticket [A] for 3.50 CHF. If you want to use it a few times, you should get a day ticket so that you can use it all day long. 1. If you are getting a day ticket, check your watch. If its after 9am, you are entitled to a cheaper full day ticket [B] for 8 CHF. If it is before 9am and you still want a regular full day ticket, hit [C] for 10.60 CHF. 2. If you are entitled to a half fare ticket (if you have a half fare card or Swiss Flexi Pass) hit [E] before inserting your money and it will make a reduction. For a one-hour ticket, it becomes 2.50 CHF, 5.60 CHF for a reduced full day and 7.60 for a full day regular. Then the machine shows you how much you owe, you slip in the change, and voila! out comes your paper ticket. Put it somewhere safe so you can access it if checked. But wait, how do I know where I am going??? You should know the number you want to take by referencing a map, or having us tell you which one to take. The tram runs two ways though so be careful to go the right way. They will be labeled with their end destination. You should reference on a map which direction you want to go, based on where you are. 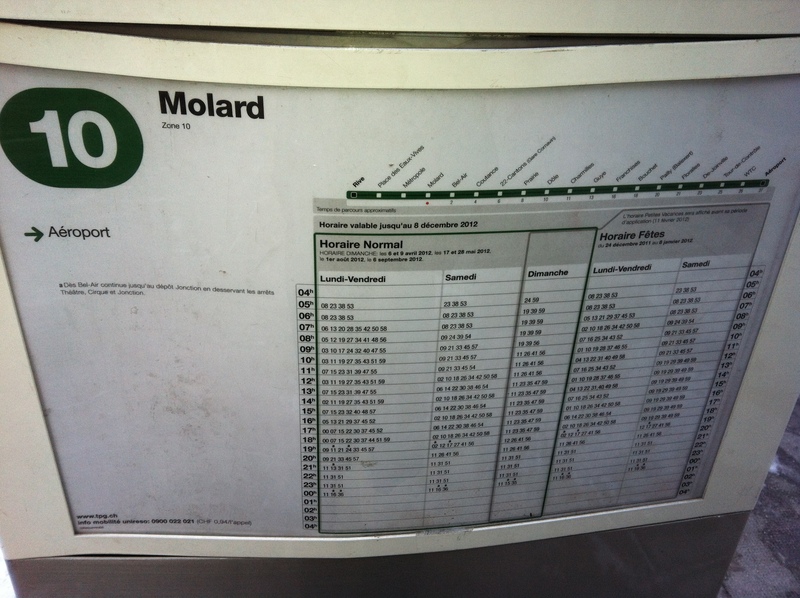 Each tram/bus stop also has the list of stops for each # on a sign that you could look at as well. Careful that some lines have different destinations to provide frequency during rush hour. For example, the #5 in the northern direction goes to Aeroport usually (the end of the line) but sometimes there is also a #5 Nations. If you are going to the Aeroport (end of the line), don’t get on the Nations #5 or it won’t go far enough. What is the difference between a bus and a tram? They work in effect the same way. You have to hit the red button on the bus to make it stop for you. However, on a tram, it stops every time. You only have to hit the red button to open the doors so that you can exit. Why do some buses have numbers and some letters? The numbers travel in town and the letters travel out further into the countryside. Are there other public transportation methods I can use? Why yes, you can take the mouettes, the boats. For a one-way, you can buy a ticket simple [D] for 2 CHF that is good for one crossing or riding the bus/tram only 3 stops (usually you ride it more than 3 stops so that is why I didn’t mention it above). Your hour pass or day pass also covers travel on these, if you already have that type of ticket, you are good to go. And…watch your wallet/purse. Pick pocketing is very common in Geneva. Just be smart! 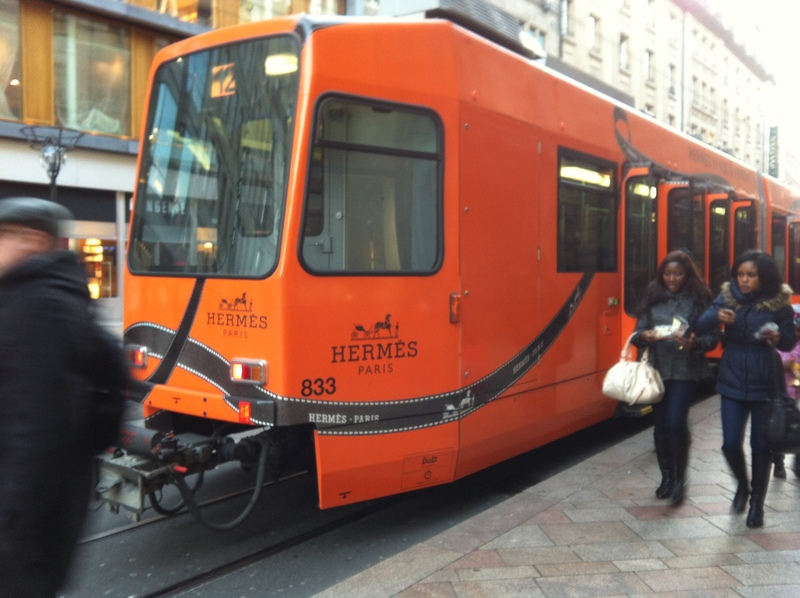 This entry was posted in Guest & Future Expat Tips, Life in Geneva, Transportation. Bookmark the permalink.